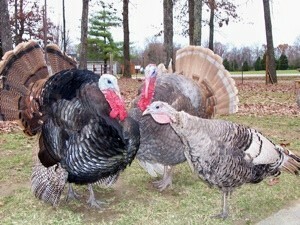 Ben, Henry and Tammy Faye Turkey all hatched in Spring '09. They are Bourbon Reds. I purchased them for pets. They like to stand on the pickup hood and look at themselves in the windshield. Sure does scratch the paint though. Sorry about your truck, but cool that they are your animal friends. We found a baby white turkey in the parking lot of a shopping center where we worked. My husband brought it home and it turned out to be one of the most awesome pets we've had. And we've had all kinds. Henrietta would follow my huband around the yard and "inspect" the work he was doing. Once he was fixing a muffler under the car and when he was done she lowered her head and stretched her neck under the car to see what he had done. We cracked up. She was very people friendly and curious. I hope you have as much fun with your turkeys as we did with ours.